There has been a lot of talk online and at various conferences these past years about change with management and culture. Most of these conversations have been around a single change or a single possible outcome. In my idea of change it is never a single event or single target, because change is more fluid and variable than most target. Over the years of working with teams on change, be it for teams, management, brands or even physical representation, I have observed when groups focus on one single outcome or definition, they overlook so many more possibilities. The range of ideas become broader than their vision. 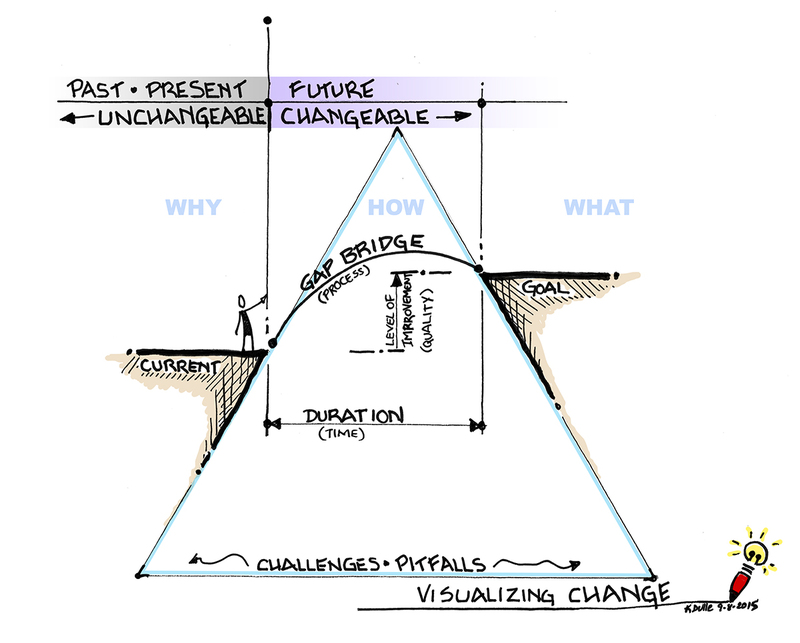 To help explain, the graphic below shows the idea of planning change in three key phases. At the start lies the current state. Unchanging and ever decaying for stagnation is decay. So many people have this idea that if they just do what they have always done that time will resolve any issues. The reality is that they are correct, unfortunately, the solution will probable be something they don’t want. When you do choose your course, one will be chosen for you and that choice is rarely in your favor. Begin by determining ‘Why’ you need to change. What happens if you don’t change and everything around is? Create a clear explanation why staying the course and letting outside forces dictate your change. My guess is you will soon realize the old adage ‘Change or Die’ begins to ring in your ears. Okay, you finally have a reason to change. Great! Now move that through a process of creative ideation. Look at various ways of how change can happen and determine what are positive and negative advantages to these changes. If you look at the change delta as a prism, the idea is to disperse all the possible variables to create a range of possibilities. It is these possibilities that can help create the possible change you can accept or are capable of performing. These variations become the ‘What’ states of change. Like light through a prism, each variation of color does not have a distinct separation from its neighboring colors. There is a blurring between each band. This is true of ideas and change. There is no clear defined path or hard outcome. Change creates variations of complexity and it is your ability and capacity to determine how complex of a change your can create. So, when you hear someone talk of change management or culture change, find out if they are talking variations or single outcomes or changes. If it is a single possibility then use the prism of ideas process, commonly called ideation, to create multiple options and find which solution works best for you or your business. Avoid the static and the stagnate states of daily life, always plan by seeing your goals and mapping the journey to them. No, this is not a story of a little girl and her pet rabbit. In fact, this is about how employees and customers react to a company’s environment. During a past ideation session with a client group, I was graphically co-facilitating on a large white board some of their responses about their customers in their centers. During part of the team activities I over heard one of them say, “We hear such great things about our staff and the environment from our customers.” In response, I added some exclamation marks above the heads of the customers I had drawn interacting with the staff to emphasis the positive response. During one of the breaks, a few of the participants had gathered in front of the visual recording and were making humorous comments about the pigtails and rabbit ears I had put on people. “Pigtails and rabbit ears?” I asked. They pointed out that the exclamation marks I had drawn over the heads and how it had made them look like they had pigtails and rabbit ears. Sure enough to my amusement I had. Unknowingly to me when, In order to add relevance to the comment, I had made some of the people cute girls with pigtails and others, people with rabbit ears. After that, when that group discussed the experience being staged for employees or customers they would challenge the rest of the group by asking if it would give the employees and customers pigtails and rabbit ears. To my surprise, a humorous visual edit quickly became shorthand for measuring a positive experience. Since then, I ask myself during client ideations about headquarters or customer spaces if they are actually creating enough of a positive experience within their environments that the reactions from those engaging in the experiences would generate pigtails and rabbit ears on drawn people? One of our goals for our clients is to help develop experiences that would exceed expectations and create positive memories, experiences that employees and customers would share with others. I challenge you take a look at your employee and customer environments and interactions. Are they dynamic enough to put pigtails and rabbit ears on your people? If not, how could you change the environment and the interaction to do so? Maybe we can help? Until next time, keep thINKing in Ink and stay ahead of the problem. The world we live in is a funny place. Conversations, styles and even perceived needs are cyclical. What is old is new and new, well, that’s so this morning. Every thing changes. Everything. Those things, people, businesses that don’t, well, that’s so in the past. Change is the only constant they say and I find it to be true. Change up, change back, change around, change out, change into, etc… We have so many perceptions of change that the adaptations seem endless. Change comes in various sizes and increments. Some changes are dramatic while others are subtle. No matter what, change happens to us all each day. The real goal is to try to guide change as best we can, because change never happens as we expect. It always has hidden surprises or consequences. But what is change? When does something or someone change? I guess that answer lies in the eye of the observer. Only those closely watching can see the change happening, but for most, we see the event after the change. But what if you could plan change in some fashion. This I have asked for some time and here is what I have created. Based on the idea that yesterday and today are unchangeable, if you avoid any theoretical ideas of time travel, that only leaves the future for change. And, if change only happens in the future, than you can guide the outcome given you can determine all the factors affected by change. And so, here is my model for change. This is my Delta model for change. Even if you stand at the very edge, change will occur. Time always moves forward and you must move with it. But you can decide how you want the change to happen and what you want the change to create once you understand why you want or need the change to happen. As the model indicates, change should be an improvement and performed of a duration of time through some given process. Also, you must determine any and all pitfalls and obstacles that may hinder you crossing the gap of change. Map the change before you act. Take you intangible idea and make it a tangible plan. There’s a growing trend in America. A trend where the world of art and artists are collaborating with businesses and business leaders to generate a richer offering as well as a new perspective on creating healthier and stronger businesses. There is no better avenue for this thinking in St. Louis than the SPARK Conference hosted by COCAbiz at COCA. I was honored to be able to perform the graphic recording of the event, for Sharon Price John’s morning presentation and for the evening’s Keynote address by John Maeda. 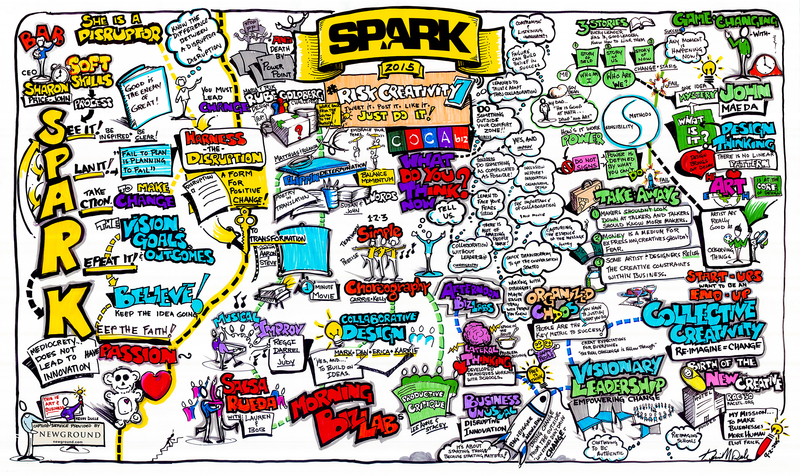 Below is the large-scale graphic recording of the full day event of SPARK at COCA. Please check out the wonderful services and programming that COCAbiz has to offer by contacting Steve Knight at COCAbiz. Just follow the link and get creative with business solutions.